FREE HIGH SPEED WI-FI WIRELESS INTERNET!! BRING YOUR LAPTOP! We now have security enabled wireless Cable internet. HILTON HEAD... You'll cherish the fabulous views from this spacious, oceanfront villa. It has a two-bedroom floor plan featuring a master bedroom suite with king bed, lots-of-room in the living area with sleeper sofa, full kitchen, and private balcony. You will also enjoy the big oceanfront heated pool adjacent to a large cabana that has a covered deck. There's a kids' pool, too. Captains Walk is conveniently located on one of the finest beaches on Hilton Head, a central location on the bike path between the Mariott Beach and Golf Resort and Hilton Hotel. The Fazio Golf Course is a short walk away. Other golf courses, bike and canoe rentals, the tennis center, restaurants, and night spots are also nearby. No detail has been spared in this fantastic villa. Designer decorated, the owners of this villa have made it the perfect home away from home. The kitchen comes fully-equipped and features custom countertops and a laundry room with a full-size washer and dryer. The dining area seats six comfortably and leads to a bright and cheery living room with panoramic views of the Atlantic Ocean. This room also has a sleeper sofa, flat screen TV, a VCR/DVD player, and sliding glass doors to a spacious oceanfront balcony with seating for four. This is a perfect area for morning coffee or early evening dining. The master suite of this wonderful villa has a king bed, LCD TV, DVD player, and a private bath. The guest bedroom has two twin beds and LCD/DVD TV. This bedroom also has a private bath. This villa is one of our favorites, and is sure to be one of yours! The Captain's Walk complex has beautiful landscaping, barbecue area, an oceanfront pool and hot tub. 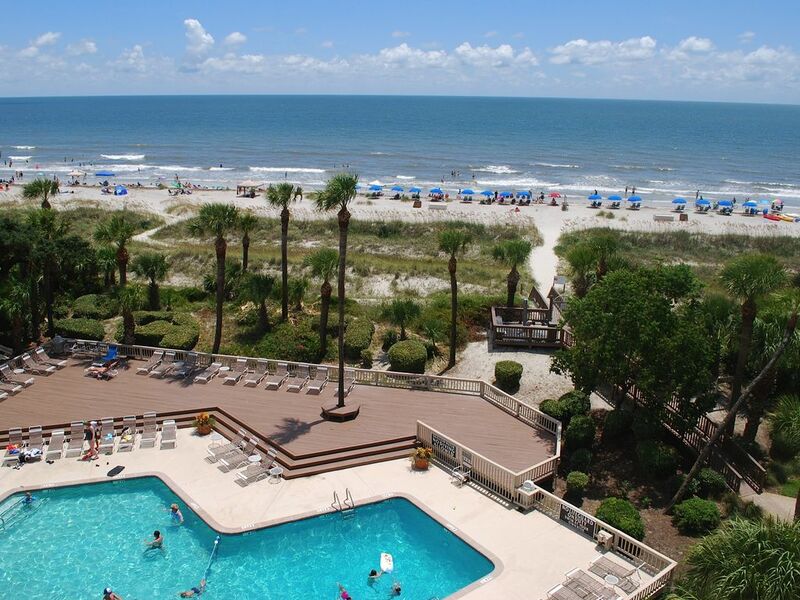 Located in Palmetto Dunes, a semitropical resort with the best beach on Hilton Head, it offers a relaxing, secure vacation location year-round. It's a wonderful experience, one you will enjoy returning to year after year!